Louder. Closer. Cleaner: X/Y recording allows you to cover a wide area yet still capture sound sources in the center with clarity and definition, making it ideal for all types of live stereo recording. The XYH-5 X/Y microphone capsule included with the H5 provides two matched unidirectional condenser microphones set at a 90 degree angle. These are housed within an advanced shockmount that employs rugged external mic wires and rubberized material to isolate the unit from the H5 body and thus minimize vibration and handling noise. The design of the XYH-5 also allows the H5 to handle louder sounds than any other Handy Recorder model: 140 dB SPL, to be precise-equivalent to the sound of a jet aircraft from less than 200 feet away-enabling you to capture sounds louder, closer, and cleaner than you ever could before. Interchangeable capsules that can be swapped out as easily as the lenses of a camera: The H5's modular design means that you can always use the best microphone for every recording environment. Ultimate In Image Control: Welcome to "Mid-Side" recording, a whole new level of precision in your ability to shape sound. The MSH-6 Capsule contains dual mic elements - a forward-facing, unidirectional mic (the "Mid") and a side-facing, bi-directional mic (the "Side"). Together with the H5's onboard MS decoder, they capture a fully mono-compatible stereo image that can actually be adjusted after recording - ideal for film, video, and television projects. All the Pickup, Half the Length: The optional SGH-6 Shotgun Capsule adds a professional-quality, highly directional microphone to the H6, creating an ideal audio setup for film, video, live theater, and ENG (electronic newsgathering) applications. Three elements combined with digital signal processing inside the SGH-6 give you the highly directional pickup power of a conventional shotgun mic in a unit only half the size - ideal for recording dialogue and narration with no intrusive mic in the scene. Expanded Connectivity: Plugging in the optional EXH-6 Dual XLR/TRS Combo Capsule gives you two more inputs. This allows you to connect up to four discrete signals from external microphones, instruments, mixers, or portable music players to fully realize your audio vision. It's all the power of a professional recording studio, right in the palm of your hand. Live Recording Personified: The XYH-6 capsule adds two matched high-quality unidirectional microphones to your H6 or H5. This kind of microphone is most sensitive to signal coming from directly in front, and less sensitive to signal coming from behind or from the sides; in technical terms, they are said to utilize a cardioid polar pattern. These mics have the largest diaphragm size (0.579" = 14.6mm) of any ever available on a portable recorder. User Interface: In addition to standard transport controls (stop, play/pause, record, rewind and fast-forward), the front panel of the H5 offers dedicated record arming buttons for each track, which double as mute switches during playback. A Hold switch disables all front panel buttons to prevent accidental operation during recording. The H5 can be attached to a camera strap or, with the use of our optional Hot Shoe mount, mounted directly to a DSLR or camcorder. Inputs: The H5 also provides everything you need to connect with the outside world. Dual combo XLR/TRS inputs that can handle both mic- and line-level signals allow you to connect external microphones and line-level devices like mixers, portable music players, effects processors and electronic keyboards-even electric guitars or basses equipped with active electronics. Each H5 input has its own dedicated gain control knob, located beneath a protective bar that prevents accidental movement during handling. The supplied XYH-5 X/Y capsule also provides a secondary input for connecting stereo mic- or line-level signal via a 1/8" mini phone jack. The H5 supports a +4 dB (professional) input level and utilizes the same high-quality preamps as our flagship H6, ensuring great-sounding recordings in all sonic environments. Outputs: There are lots of output options as well. A dedicated Line Out with adjustable volume allows you to send a stereo audio output from the H5 to the mic input of a video camera or other device without the need for an attenuator cable. In addition, there's a separate headphone output with a dedicated volume control. You can use both outputs simultaneously to route audio to your DSLR while monitoring over headphones. There's also a built-in speaker for fast access playback, and a USB port which allows the H5 to be used as an audio interface for your computer or iPad. Power and Storage: Just 2 AA batteries-either alkaline or rechargeable NiMH-are required for power. When using alkaline batteries, the H5 will operate for more than 15 hours, even while recording continuously. You can also use an optional AC adapter to power the H5 without batteries. The H5 records directly to SD and SDHC cards up to 32 gigabytes. Maximum recording time is dependent upon the card size and file type; for example, the supplied 2GB SD card can hold approximately fourteen hours of stereo 320kbps MP3 files, three hours of stereo 16-bit / 44.1 kHz WAV files, or an hour of stereo 24-bit / 96kHz WAV files. File Types: The H5 can operate in two different modes-choose stereo for two-track stereo recording, or multitrack for four-track recording (in either stereo pairs or individual mono tracks)-and it captures audio in the two most commonly used file formats: WAV and MP3. The WAV files recorded by the H5 can be 16- or 24-bit, with sampling rates of 44.1, 48, or 96kHz. They are automatically time-stamped and thus Broadcast Wave Format (BWF) compliant, allowing for precise synchronization in video post-production. MP3 files, while slightly lower in fidelity, are much smaller than WAV files and are thus easier to email and post on social networking sites-allowing you to quickly and easily share your creations around the world. Signal Processing: The H5's onboard effects allow you to add polish to your recordings. Compression and limiting compensate for fluctuations in input level, while a low-cut filter helps eliminate wind noise, blowing, and other kinds of low frequency rumble. There's even an onboard metronome and chromatic/guitar/bass tuner. Other features: But the list of H5 features doesn't end there. There's playback looping, pitch change and variable playback speed (without pitch change) to help with phrase training. 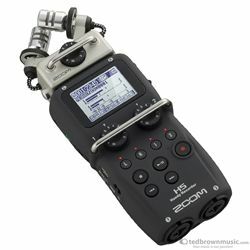 A pre-record function that keeps the H5 continuously recording in the background, keeping the previous two seconds before you hit RECORD. There's an Auto-Record function that allows recording to begin automatically when a certain level of sound is detected and an equivalent Auto-Stop function that ends recording when the sound drops below a user-designated level, either immediately or up to 5 seconds later. And then there's Backup-Record-the ultimate safety net. It enables the H5 to automatically record a duplicate set of stereo tracks with 12dB less input gain. Even if your original track is distorted, chances are the Backup version will be fine! You can even use your H5 as an audio interface, complete with a Loop Back function that makes it easy to add narration to music playback. Simply connect the H5 to your computer or iPad via USB, launch your favorite DAW or use the included Cubase LE or WaveLab LE software, and start creating a masterpiece. Attach to a Video Camera as an External Microphone: The H5 is perfect for use on a video or DSLR camera. The remarkable depth and clarity of sound achieved by the stereo mic design brings additional realism and depth to HD video. By attaching the H5 to a DSLR video camera with an optional hot shoe mount (HS-1), you can create a professional video system with high-quality sound.